The conditions of social life that are reflected in the conditions leading to the formation of the individual’s identity may be changing due to the influences of postmodernity. In Finland today, Jews form a small minority group within the borders of secularized Lutheranism. How does the Finnish Jewry cope with the constant transformation of social values in this context? How does Jewishness appear in their self-perception and in their daily lives? 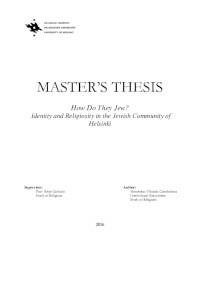 The purpose of this thesis is investigate how members of the Jewish Community of Helsinki view Judaism in their own lives and in their community and how do they observe the rules of the Halakhah – the Jewish law. This work provides an introduction to traditional perspectives of the questions that are often topics of debates in postmodern Jewish communities. In one sentence: How do they Jew in public and private life in modern Finland? The research was put into practice by combining quantitative and qualitative methods, including a quantitative questionnaire that was distributed to all 777 adult members of the community and personal interviews with 8 individuals among them. Both the qualitative and the quantitative research questions explored issues of Jewish life and traditions as well as attitudes towards the most common Jewish issues in contemporary Finland. The results showed that the vast majority of the respondents strongly identify as Jews. They have loyalty towards their Jewish heritage, but also feel a strong sense of belonging to Finland. They are generally lenient towards Halakhah, and despite being members of the Modern-Orthodox community, they do not necessarily live orthodox Jewish lifestyles according to the traditional – orthodox – perspective.